Republic of Turkey is known as one of the transcontinental country which lies on two different continentals, Asia and Europe. If you see on the border map, the country itself is primarily located on the Asian side. 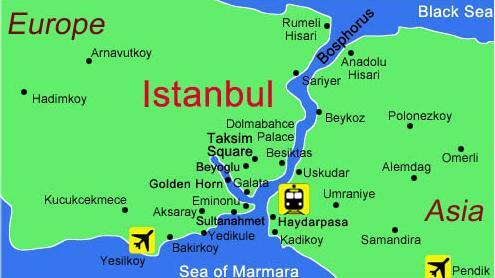 Istanbul in the other hand, lies on both Asian side and European side. European side is separated from its Asian side by the Bosphorus strait that connects the Black Sea with the Sea of Marmara. There is also a bridge called Bosphorus bridge that connects the two sides. I'm not a geography expert, but I'm just remembering what the tour guides said and all the facts got me good! Oops, almost forgot, we went on a boat tour down the Bosphorus. It's a great way to get a glimpse of the beautiful Istanbul. You’ll ride past many mosques, hotels, houses like a palace and other beautiful greenery throughout the boat journey. Speaking about Istanbul, the bustling vibes around the city was the proof that it's the most populous city in Turkey. The city was a mixed of a modern and historical place where you can see many commercial buildings such as banks, hotels, stores, etc along with some old fortresses from the past at the same time. 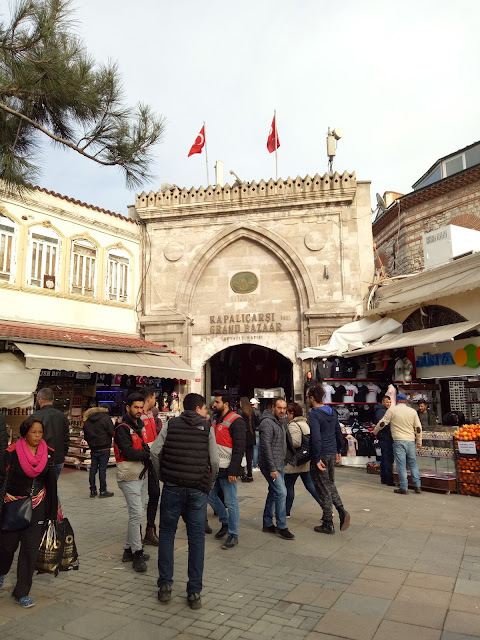 Some of the attractions I have visited during my time in Istanbul were Hippodrome, Blue Mosque, Hagia Sophia, Topkapi Palace, and did a little bit of shopping at the Grand Bazaar. The area used to be a sporting and social center of Constantinople, capital city of Byzantine Empire. Now it's an area called Sultan Ahmet Square. Originally named as Sultan Ahmet Mosque, the popular tourist site continues to function as a mosque until this present day. 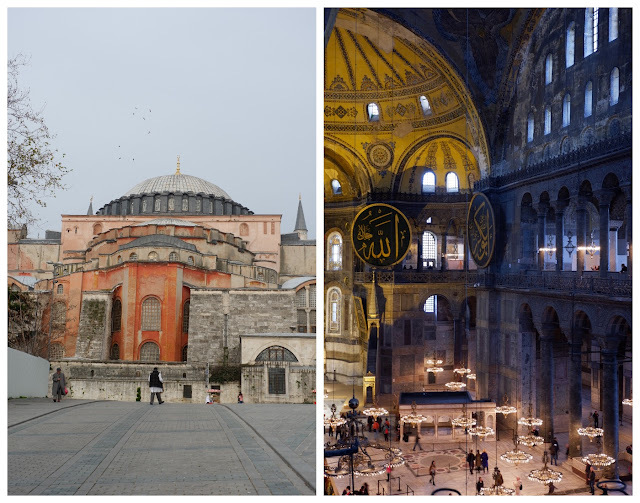 Hagia Sophia was a Greek Orthodox Church, later a mosque, and is now a museum called Ayasofya Musezi. Back in the 15th century, it was a place for an administrative headquarters and the main residence of the Ottoman Sultans. Now, it has been transformed into a large museum for tourists. Home for more than 4.000 shops that sells various Turkish souvenirs, handmade bowls, Turkish delight, carpet, old books, evil eye, etc. Moving on to the Asian side of Turkey. As I'm not going through all the details, I will be highlighting some of the places that hold a special place in my heart, those places that bring memories. During the whole trip, we were using a bus to take us from one place to another, city to city. 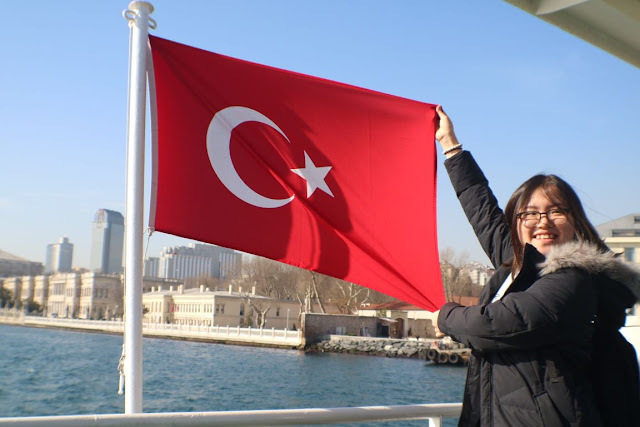 However, that one day when we were moving from Istanbul to Canakkale, we took a ferry boat down the Sea of Marmara. If you are wondering, our ferry carry both vehicles and passengers. There was a room upstairs in the ferry for you to sit, buy some food and drinks and enjoy the view. The weather is so cold this time of year, so better stay inside. Still, if you stay outside, you can breathe the breezy fresh air, see the beautiful surroundings and you will get a chance to feed the birds that flying around the ferry, too. It was really beautiful. I stayed outside for a while and went straight inside because the wind was too blustery and cold. 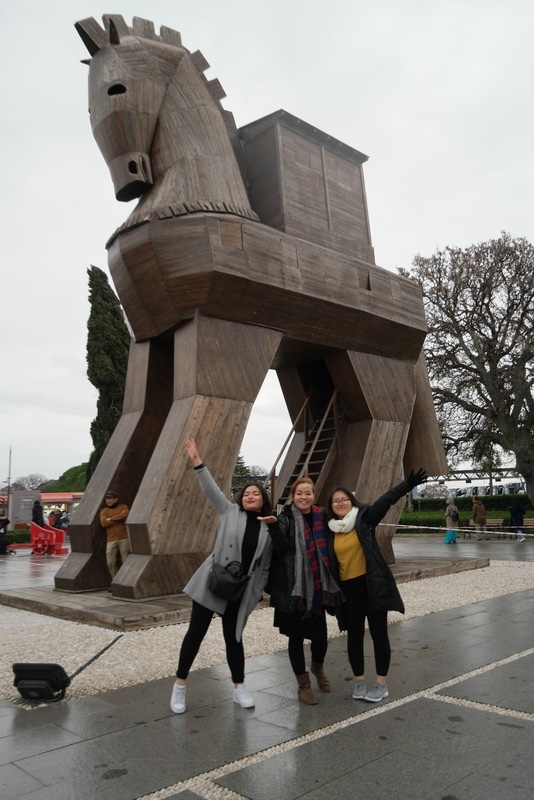 After around 30 minutes ride, we were heading to Ruins of Troy, a historical site of Trojan War along with the Trojan Horse replica. Besides Ruins of Troy, the other two ruins sites I have visited were Asklepion in Pergamon (Bergama) and Ephesus in Seljuk (Selcuk). 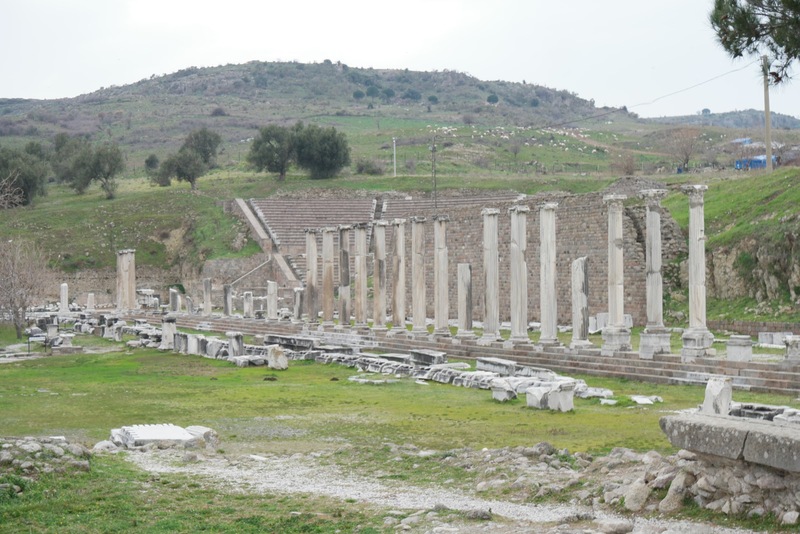 Asklepion in Pergamon was a healing place aka medical center a long time ago. The story behind it was really interesting. The healing process back then was quite like a spa these days, or maybe something more. Psychotherapy, massage, herbal remedies, mud and bathing treatments, sleeping with relaxing water sounds, the interpretation of dreams, drinking water from a sacred fountain, and music concert or comedy show. All the ruins left were something I have never seen anywhere before, except in the movie. However, by seeing it with my own bare eyes, the entrance gate and the old theatre in particular, was an amazing experience after all. 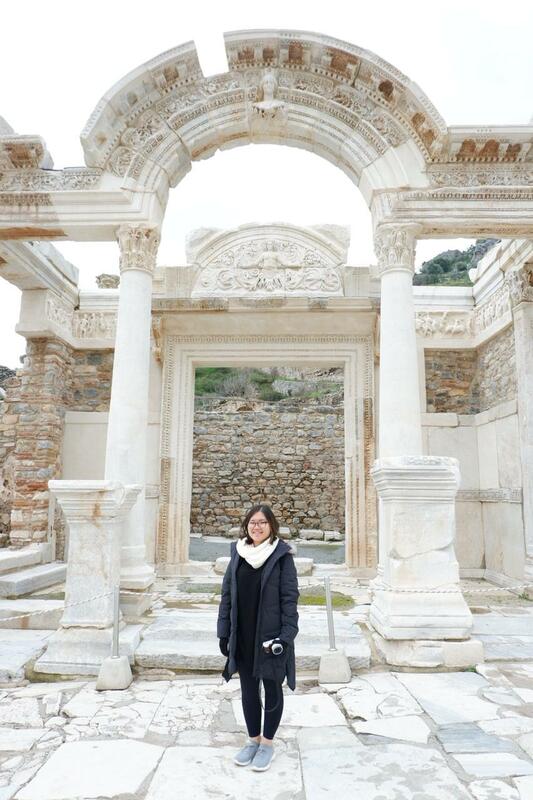 Next, Ephesus. This one is hands down my favourite ruins. The area itself is bigger than the Asklepion, plus there are still lots of ruins standing inside the area to be explored. 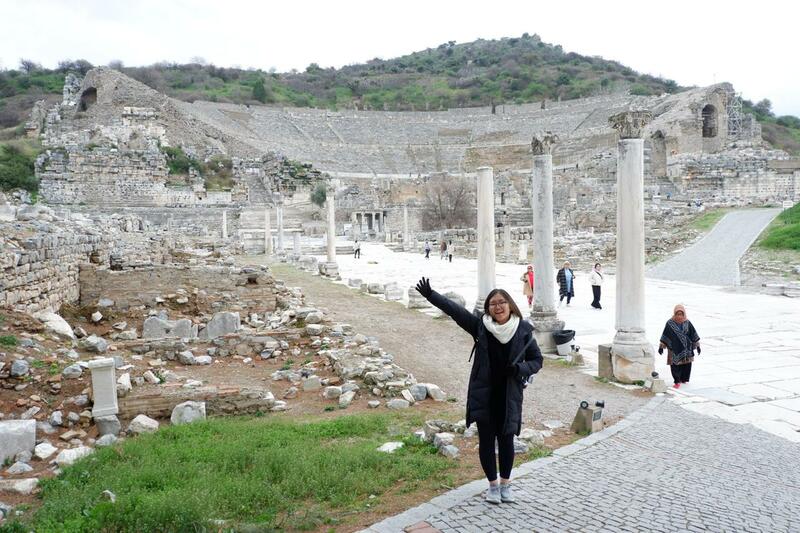 Quick fact, Ephesus was an ancient Greek city located in Selcuk, Izmir Province. Believe me, you may find something you don't expect. From what I remembered, there are ancient public toilets made of marble, marble street which was used to be a local market back in the day, stone carving of the Greek Goddess Nike aka Goddess of victory (yes, I'm talking about the sport brand Nike, named after the Goddess), huge library of Celsus and many enticing areas that can still be seen until this very day. Clearly by seeing all of the ruins, the ancients had the incredible construction skills and an extraordinary eye for detail. I love the word 'Pamukkale'. 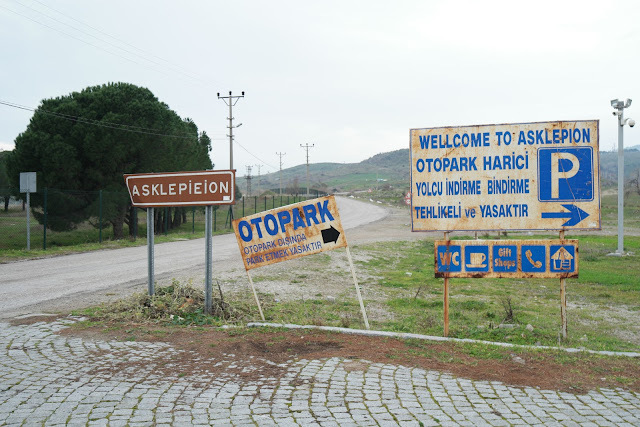 Not just the word, but I love the way Turkish people pronounce it, too. Tell me I'm weird, but the meaning behind those word is also beautiful and magical. It means Cotton Castle. To get to the hot springs, we had a little ride with a big golf cart accompanied by a view of another ancient city called Hierapolis. 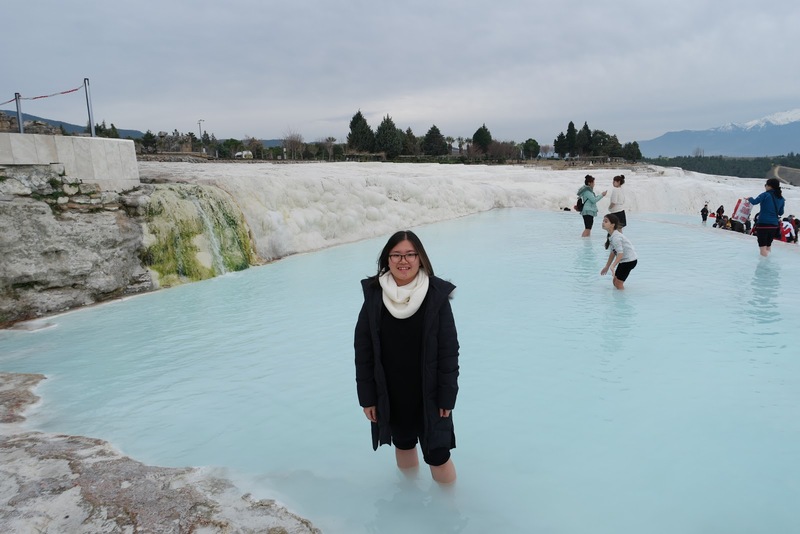 The hot springs itself shaped like terraces made of travertine, a sedimentary rock deposited by water from the hot springs. As you can see from the picture, the area is covered with shimmering white stone which refers to the name Pamukkale or Cotton Castle. The water also rich in minerals. As from now, visitors are allowed to enter the hot springs with barefoot, follow the path and soak their feet into the water. Through my experience, the water was hot enough to bear and it wasn't that deep, perfectly beneath my knees. 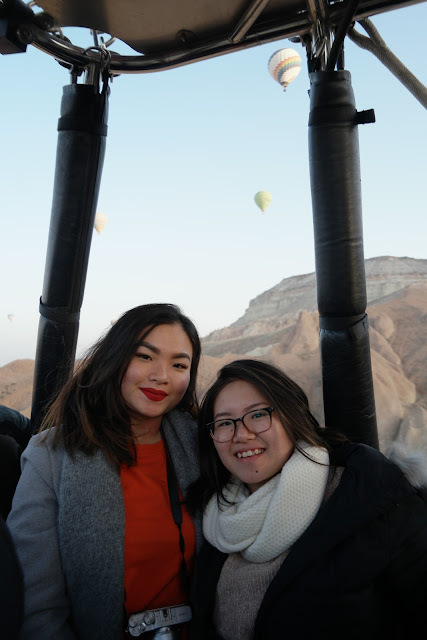 One of the happiest moment of my life was riding a hot air balloon in Cappadocia with two amazing pilots and the rest of my travelling mates. I don't know how to describe this one. The question is now, what is really like to ride in a hot air balloon? You are basically in a big basket with an enormous balloon above you and you are flying up high in the air. But it's something more than that. It was a super chilly morning and miracles was upon us that the balloon can be flown that day. Actually, we tried to ride the balloon the previous morning, but the weather was too bad for the balloon. We were super lucky to be able to ride it on the next day. As we arrived there, our balloon was being prepared. Some of the other hot air balloons were already up in the air. There were so many of it and I have never seen a beautiful morning sky like this. First thing first, the crew told us about the general info and the safety instruction. They also taught us the right body position for landing. After a short briefing, slowly but surely the balloon started to rise. From above, we saw the amazing view of Cappadocia surrounded by weird shaped rocks, from pointy rocks to mushroom-shaped rocks. We also witnessed the morning sunrise. The weather was not that cold up here compared to when we were still on the ground. We were floated up in the air for about one and a half hour. I was so happy to see snow for the first time. 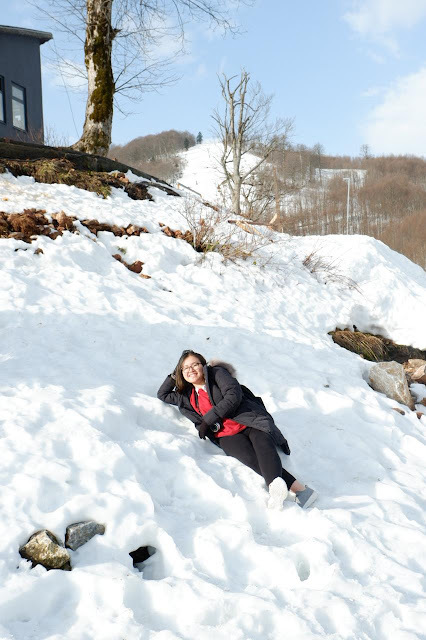 Though it's not snowing at that time and the remaining snow was already starting to harden, I was really happy still. Me and my sister also got a chance to try the chairlifts for the first time for only 10 Turkish Lira (around Rp40.000). We did some epic boomerangs with the icy snow and took many crazy photos while sitting and lying down on the snow. Actually, we can go skiing and renting the equipments, but we didn't have much time to do so. Maybe, someday in the future. 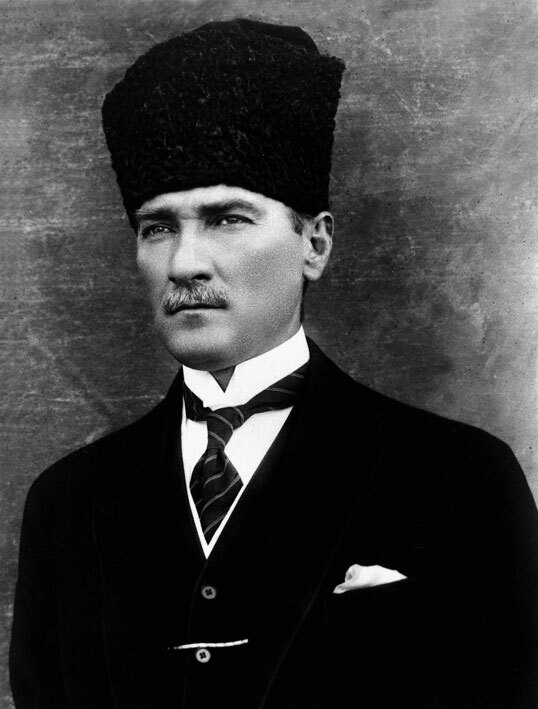 Last but not least, I visited the museum and mausoleum of Mustafa Kemal Ataturk, the highly respected figure and the founding father of Turkey. The whole area itself located in the beautiful Ankara, the capital city of Turkey. As I walked in, I was amazed with the square building right between the museums. The building I referred to called 'Anitkabir', meaning memorial tomb in English and it's home for Ataturk's final resting place. Beside the Anitkabir, you can see war dioramas, figure statues, painting and pictures of Ataturk, Ataturk's personal items such as his wardrobe, wallet, cigar, etc inside the spacious museum. The area was guarded by several soldiers, you can take a photo with them but do not touch or speak with them, they will remain silent. At certain times, you will be able to see the changing guard ceremony, which was really cool in my opinion. One more thing, Mustafa Kemal Ataturk biography is something you need to know also, very very interesting and inspiring. 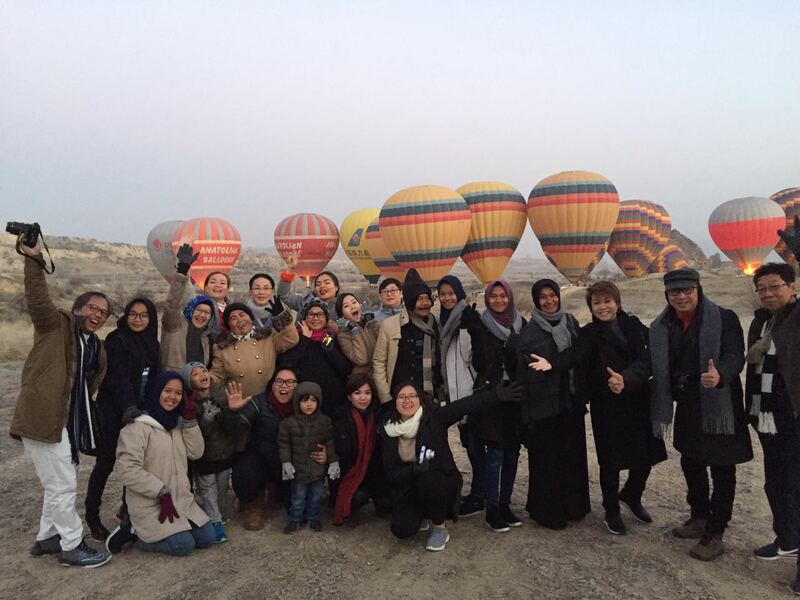 To wrap up this post, I have some extra information and tips for you from how to survive the cold weather during this time of year, eating local foods, what to buy, and changing your Rupiah to Turkish Lira. Let's break 'em down! 1. It's still winter in Turkey, but how cold is it? Do some research! In the beginning of February, the weather prediction was around 13 to -5 degree celcius and it was right. If you don't want to be bother with bringing so many jackets and coats, I suggest you to pack only one thermal jacket. Before you buy the thermal jacket, make sure it will hold until certain degrees. My thermal jacket works until -15 degree celsius which was really great. For the clothes, do bring long johns and sweaters. Let the layering magic works to warm your body. In addition, don't forget to bring gloves for your freezing hands and socks to wear underneath your boots or sneakers. Umbrella also necessary. 2. To be honest with you guys, I had a love and hate relationship with Turkish cuisine. Within the first, second and third day I was still enjoying the food, but the next day until the very end of the trip, the food gets really boring and boring. 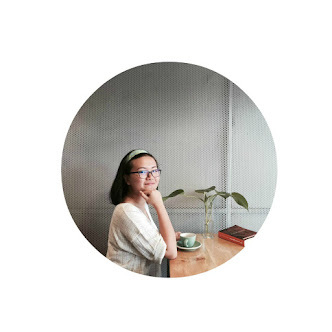 Every time that we eat, the first menu that came to our table was soup, whether it's tomato soup, mushroom soup, or other flavour that I can not tell. We ate the soup with the bread. From what I remembered, I eat a ton of olive oil rice, grilled chicken, beef and veggie stir-fry and salad. To survive this problem, I suggest you to bring something that will increase your appetite, for me it's sambal, spicy anchovy and beef floss. Still, I have one favourite meal throughout the trip. It's a Turkish meatball from the restaurant called Ramiz. It served with fries and fresh salad. 3. 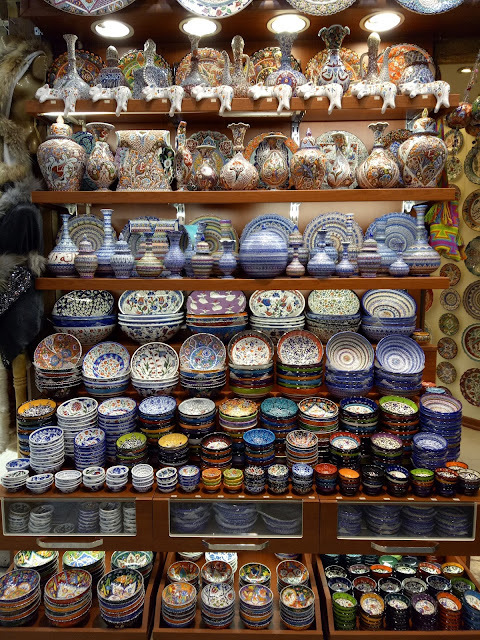 What to buy when in Turkey? I'm not going to talk about Turkish delight, expensive handmade carpet, or turquoise jewellery. 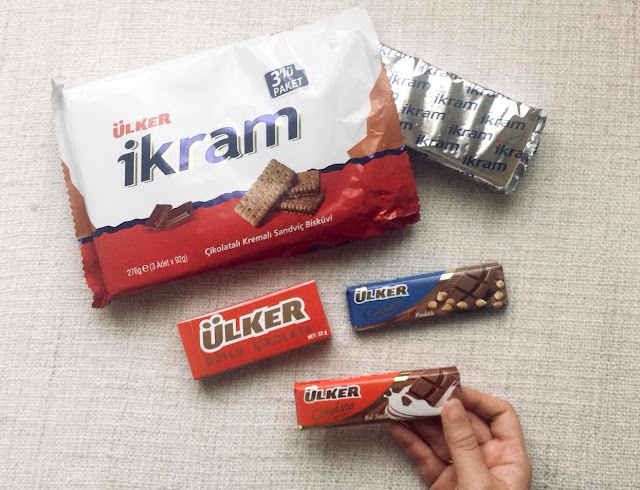 Maybe you should try the Turkish delight once in your lifetime, since it's one of their signature. 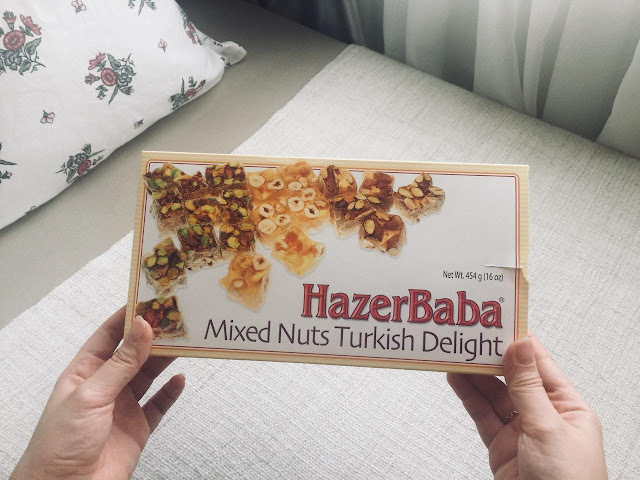 Turkish delight is a dessert made out of starch and sugar or honey with dates, pistachios, walnuts, hazelnuts chopped inside. It shaped like an ice cube covered in icing sugar and packed in a box. In my very honest opinion, the taste is way too sweet, I repeat, way too sweet. Moving on to other souvenirs or snacks that you should try and bring back home. First, the Evil Eye or Nazar in Turkish. It's an eye-shaped amulet that is often worn by the people as jewellery or hung in homes, cars, etc to protect its holder from bad things. 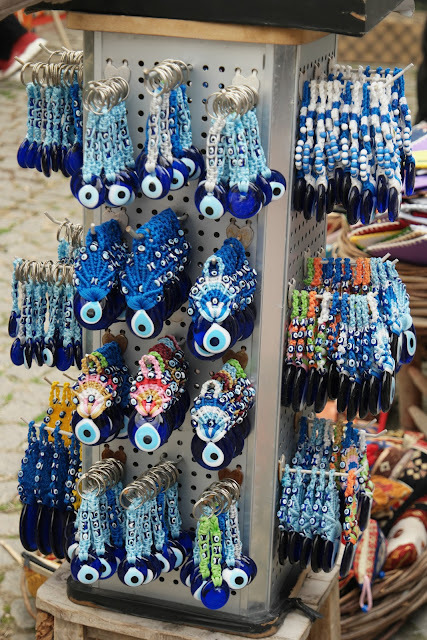 You can find this Nazar literally everywhere around the tourist area. As for things, I also suggest you to bring home some colourful coasters and handmade bowls (as seen in the pictures). They are just so adorable. Now, snacks! Go to their supermarket or mini market and spot every snacks produced by the brand 'Ulker'. I guess you will never go wrong with that. At first, I tried the chocolate and it was bomb! Next, I tried the biscuit and it was amazing, too. They have the best products! 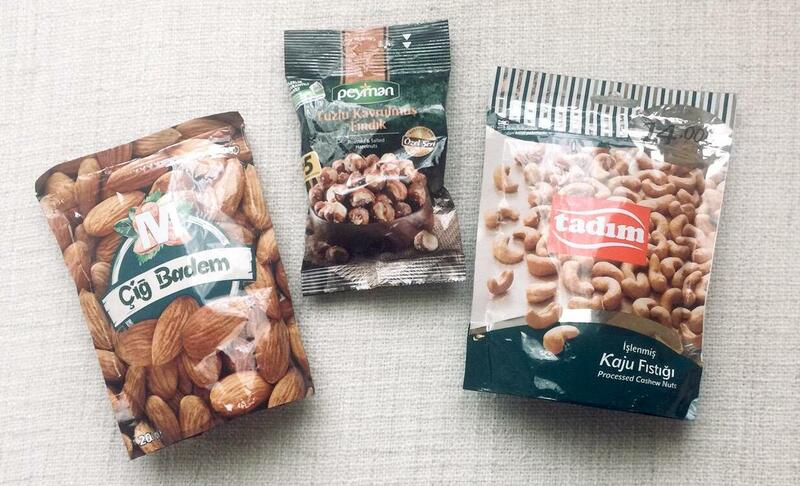 For alternative, you can also buy packed nuts (raw almond, walnuts, hazelnuts, pistachios), it's also good. 4. Since you will be using Turkish Lira, exchanging your rupiah to Lira is a must, but you will get less money instead. It's because the low exchange rate, so you'll get less of the foreign currency you're buying. Instead of Lira, they also accept dollars and euro, so you better split some money you want to exchange. A little bit of Lira and a little bit of dollars or euros. Extra information, prepare some coins (1-2 Turkish Lira) if you want to use the public toilet. Peeing is not free guys. And the very final question is, IS TURKEY WORTH VISITING? Absolutely YES! 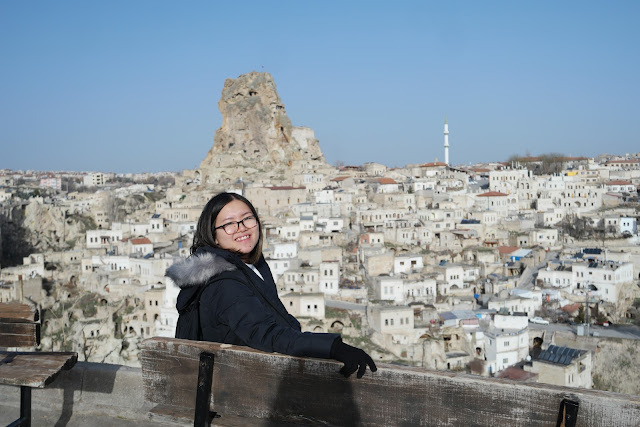 Every city I have visited has their own uniqueness, Cappadocia for instance. The area is surrounded by many weird but beautiful stones like you've never seen anywhere before. There are still houses made out of stones. During the bus journey from one city to another, you can see the beautiful view from your left and right, green field, rock mountains, maybe it's like driving in Nevada, super long road with amazing view. It's definitely worth visiting! 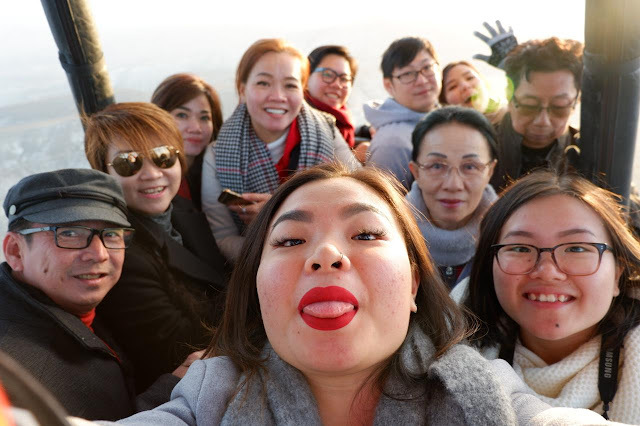 Above all, thanks to Panorama Tours for making the trip filled with so much fun. To Kak Raina, if you are reading this, you are awesome! I envy you a lot, to be able to travel the world and knowing the story behind each country. I'm happy to have a little bit of knowledge about Turkey from you and our local tour guide, Mr. Gokhan. Shout out to you! Also, Mr. Murat, what an awesome driver you are! Thanks for driving us along the trip. And to everyone, I'm happy to know all of you, I'm looking forward to our next journey together! If you have some other questions, feel free to ask me down in the comment section or send me a dm through instagram. Have a nice day and see you in the next post! Hello from Turkey! I am glad that you enjoyed your trip to Turkey. It sounds great and full of activity. However, I want to add that Turkish cusine is one of the richest cusine in the world. There are seven regions in Turkey and each other has its own characteristics on food. It seems that they always served the same things (a soup, a kebab, a salad, a dessert..) but it doesn’t mean that we always eat this way. It is the tour’s fault, not Turkish cusine’s. If you google Turkish cusine, you will see what I mean. I hope you will visit Turkey and have a chance to taste different examples of Turkish food. You are always welcome. Hello, thanks so much for your comment! Yes, I think it's because I was travelling with the help of a tour, so they put things all together and ready to served. I also didn't have that much free time to explore more. So, yes, I would be really happy to be back soon and try other Turkish food. 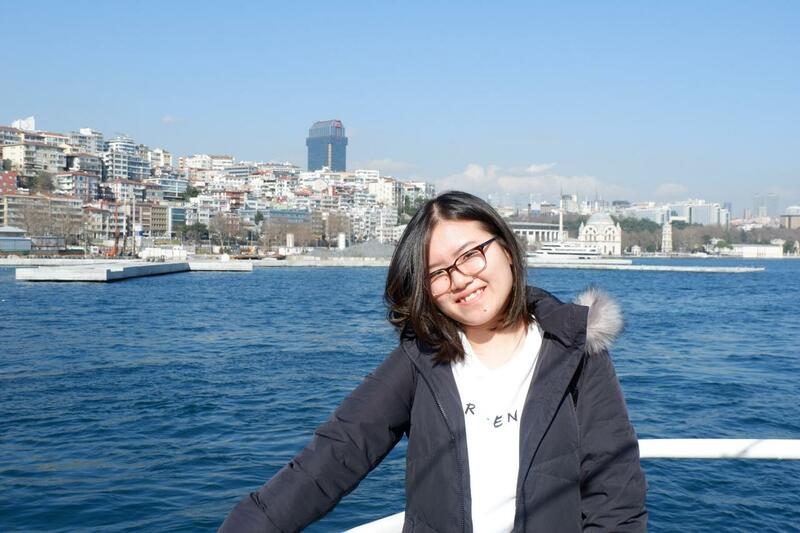 Maybe I want to spend more of my time in Istanbul, the city is very nice! Once again, thanks for the comment, really appreciate it!